As the campaign to elect the next president enters its final days, approval of Barack Obama’s job performance is as high as it has been at any point over the past four years. Yet Obama’s approval ratings, on average, continue to be more politically polarized than any president’s dating back to Dwight Eisenhower. A new Pew Research Center survey finds that 54% of the public approves of Obama’s job performance, while 42% disapprove. Obama’s job rating has not been this positive since December 2012, a month after his re-election, when it stood at 55%. Since the start of the year, the share of Americans who approve of Obama’s job performance has increased 8 percentage points, while the share that disapproves has fallen 6 points. The rise in overall ratings is due to improving views among Democrats and independents; there has been little change in Republicans’ ratings of the president. Obama’s job ratings are in positive territory despite the fact that views of his performance are more polarized than for any president in surveys dating back to the 1950s. An average of just 14% of Republicans have approved of Obama over the course of his presidency, compared with an average of 81% of Democrats. The gap in partisan presidential ratings has widened in recent decades as Americans have grown more divided in their basic values and beliefs along partisan lines and as partisan animosity has increased. Obama’s job approval is much higher than that of his predecessor, George W. Bush, at a similar point in his second term. In October 2008, just 25% approved of the job Bush was doing. 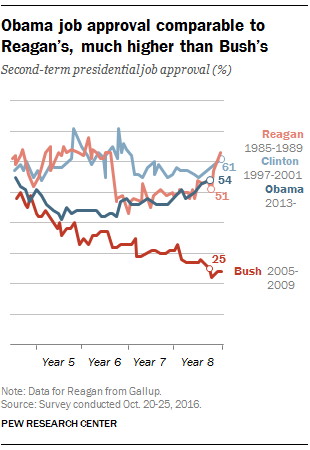 Bush’s ratings fell modestly in his final year in office. Ronald Reagan and Bill Clinton both saw improvements in their approval ratings late in their second terms. In October 1988, 51% approved of the job Reagan was doing as president, and by December of that year, his approval had risen to 63%. Similarly, Clinton’s approval rose from the mid-50s in the summer of 2000 to 61% by January 2001. While most approve of the job Obama is doing, just 33% say they are satisfied with the way things are going in the country. 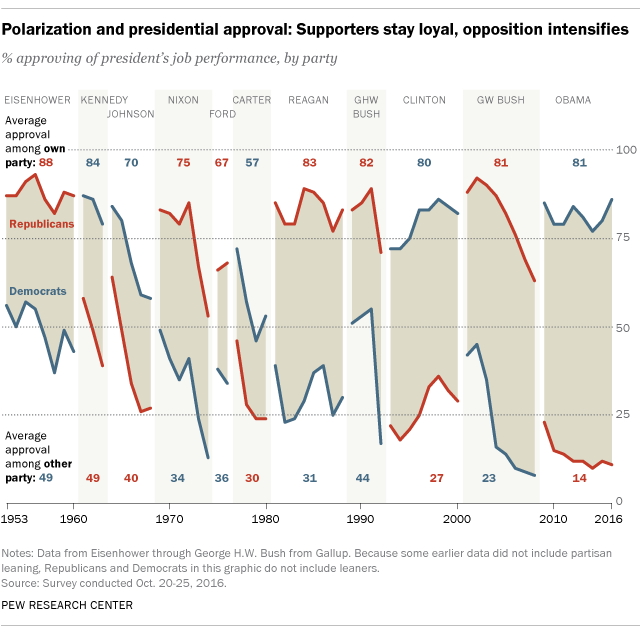 In recent elections, incumbent presidential approval – rather than national satisfaction – has proven to be the stronger indicator of vote choice, with a strong correlation between approval of the incumbent president and support for the presidential candidate of the same party. Note: A previous version of this post misstated the year for Reagan’s second-term approval ratings.